07787 504217 for your free 15 minute consultation. Chronic fatigue syndrome (CFS) and myalgic encephalomyelitis (ME) form a deeply debilitating condition with its cause unknown at this stage. It is likely that in the foreseeable future it will be classified as an autoimmune disease as there is much medical research in this area and in particular a study by Dr Kenny De Meirleir, Vincent Lombardi et, al (2013)1, which identified that CFS/ME patients were found to be immunoreactive to antibodies against proteins found in the gut. Chronic fatigue is complex in nature and may have an acute phase for example a response to a virus or traumatic event, but it is also important to look for possible predisposing factors or antecedents, which have been accumulating over many years, as well as the underlying unbalanced bio-chemical pathways in the body. Primarily chronic fatigue is a stage of burn out and may result in an inappropriate stress response from sympathetic overdrive, leading to a permanent “switched on” neurological state. As a result this may lead to unrefreshing sleep or the inability to do anything but the simplest of tasks, or manifest in fatigue on exertion. It is important to not only understand the predisposing factors, but to identifying the triggers that may be stimulating this heightened state and the body systems which keep it ongoing. Addressing imbalances in the body systems significantly affected in CFS/ME is of significant importance, these can be endocrine, immune, gastrointestinal and neurological systems, which maybe responsible for the initial acute symptoms experienced by many CFS/ME sufferers. Additionally there is also the ongoing stress of the condition to consider, when perhaps there are not answers to the questions:- What is wrong with me? What should I do? When will I get back to normal? The permanent “switched on” or maladaptive state is not conducive to healing and therefore it is very important to address the predisposing factors and influence the parasympathetic nervous system, inducing calm, relaxation and rest within the body. Imbalances that occur, may be related to the evidence of viruses, bacteria fungi and parasites an if associated with leaky gut syndrome, these microbes maybe released into the blood stream initiating an immune reaction, resulting in inflammation, possible food intolerances and fatigue. Identification of these microbes, if present, is therefore an essential part of the diagnostic process. Other disturbances may occur in the endocrine system with disruption to the hypothalamus pituitary adrenal axis (HPA axis) leading to disregulation of the adrenal hormone cortisol. Cortisol is vital in the regulation of the stress response, inflammation, blood sugar and energy production. Further disruptions may involve the thyroid gland, responsible for the metabolism of every cell ln the body and the regulation of fuel sources. Disregulation in the thyroid function may result in hypothyroidism or hyperthyroidism. Today it is recognised that in some individuals, gluten is linked to auto-immunity, recognised as coeliac disaese. However an individual may have no GI symptoms, but still have gluten sensitivity with a resulting antibody response. This may result in chronic fatigue, alongside other system problems. The cyrex test now available in the UK, can assess 10 breakdown products of gluten sensitivity as well as cross reactivity to other foods to identify those susceptible to gluten. The biggest cause of fatigue in individuals is anaemia. This medical condition maybe due to a deficiency of iron. Energy systems in the body rely on vitamins and minerals and therefore it is essential to establish a nutrient dense diet and correct and deficiencies that may have arisen. The toxic load of the liver is also an important consideration in chronic fatigue with a possible increase in burden from microbes, as well as a possible antibody responses to the presence of heavy metals, which may be endocrine disrupters. Other toxins such as pesticides fertilizers and plastics maybe challenging to the sensitive individual, and may, as with viruses and bacteria effect energy systems . 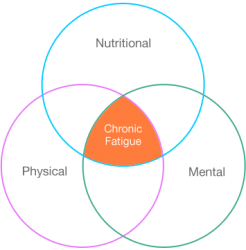 In all chronic fatigue/ME is a highly complex and multi system problem which requires appropriate understanding, testing and identification of pathogens, body system imbalances and appropriate dietary, supplemental and lifestyle interventions, to support the body’s natural healing processes and return it to homeostasis. De Meirleir KL, Khaiboullina SF, Frémont M, Hulstaert J, Rizvanov AA, Palotás A, Lombardi VC (2013). Plasmacytoid dendritic cells in the duodenum of individuals diagnosed with myalgic encephalomyelitis are uniquely immunoreactive to antibodies to human endogenous retroviral proteins In Vivo. 2013 Mar-Apr;27(2):177-87. PubMed Central. Copyright © 2019 Optimal Energy Nutrition.